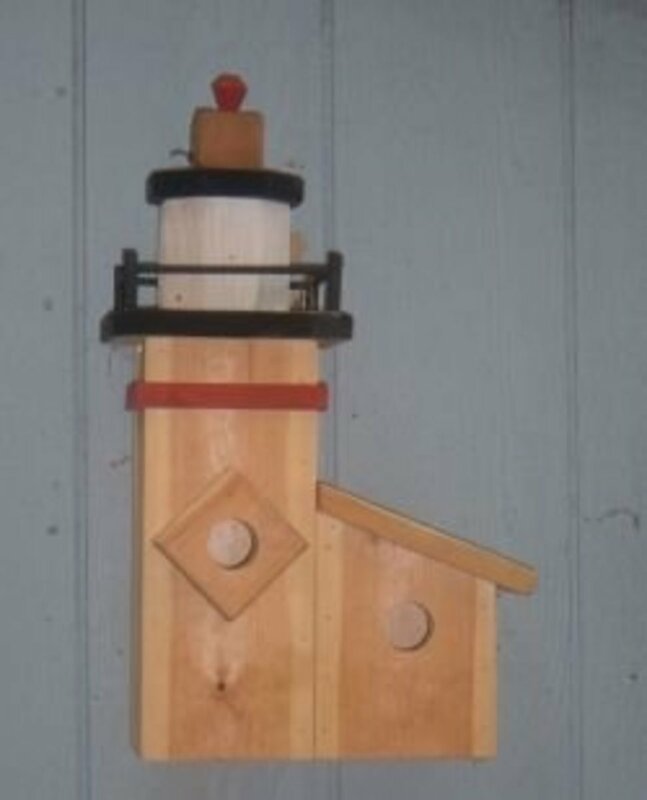 Building a butterfly house is one of those woodworking projects that are fun to make, yet don't take a lot of time to complete. Just a few pieces of lumber and an hour or soon the workshop, and the result is an interesting handcrafted accent for any garden. While entomologists and biologists question whether or not butterflies will actually use a butterfly house to take shelter from the storm, gardeners will agree that a butterfly box looks great in the garden. I made the original butterfly house from scraps of mahogany salvaged from a discarded pallet that was destined for the landfill. I really like the look of the weathered mahogany, and the lichens growing on the roof are an added bonus. The butterfly box looks right a home in our garden. 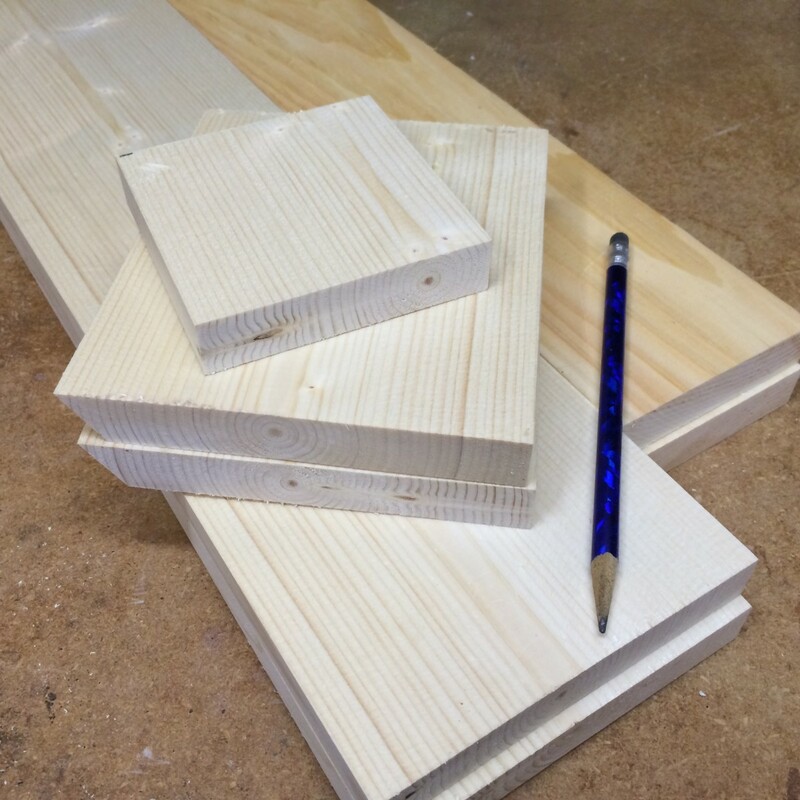 Cedar, pine ad redwood are cheaper and easier to find than mahogany, and these are also good choices for building a butterfly house. Put out into the garden and left untreated, the wood will weather naturally to a warm silvery-gray color. 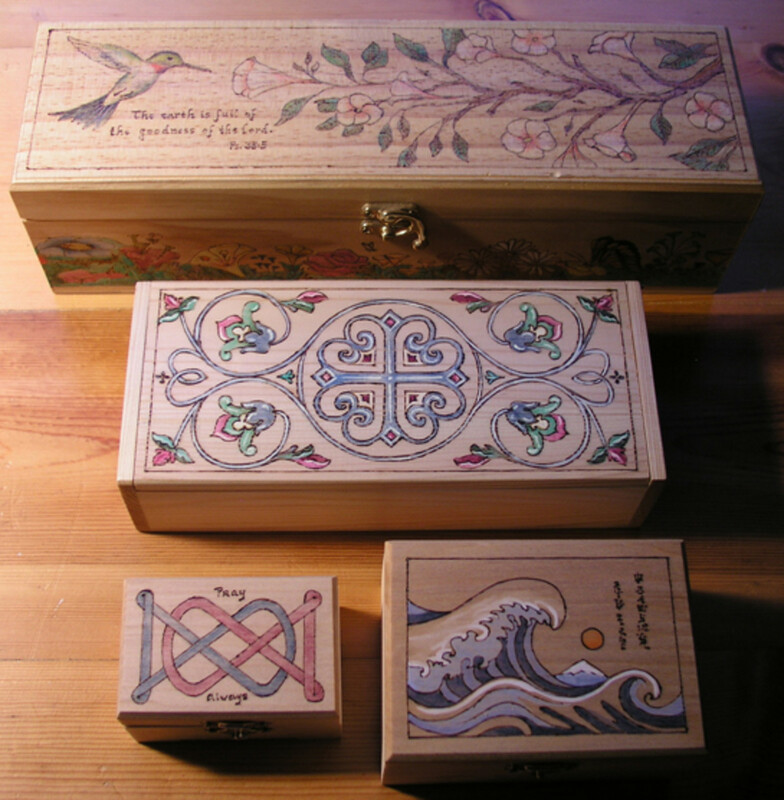 For a more colorful option, I made another butterfly box out of inexpensive pine and then painted it in bright colors. Attaching a few small decorative bits will add a touch of whimsy, and makes every butterfly house unique. Here's how I made this simple butterfly house. 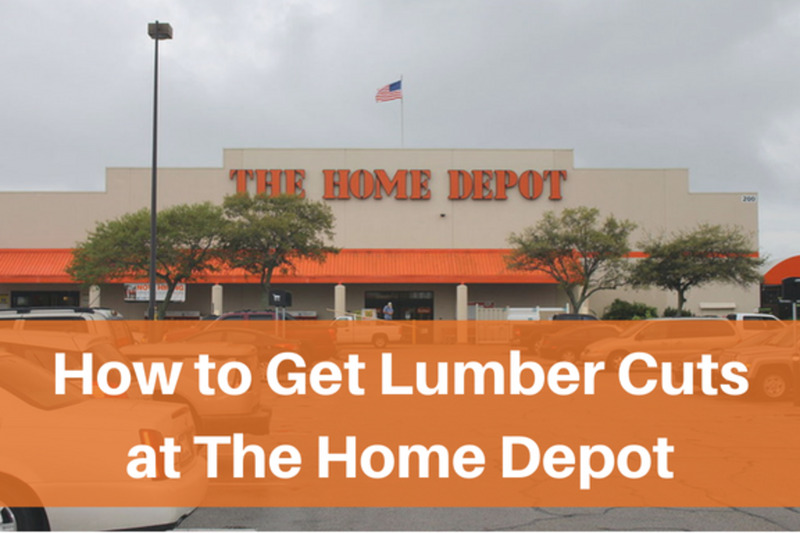 It is an easy weekend project that requires just a few pieces of wood and some common hand tools. Make two butterfly houses, and give one as gift to a gardening friend. 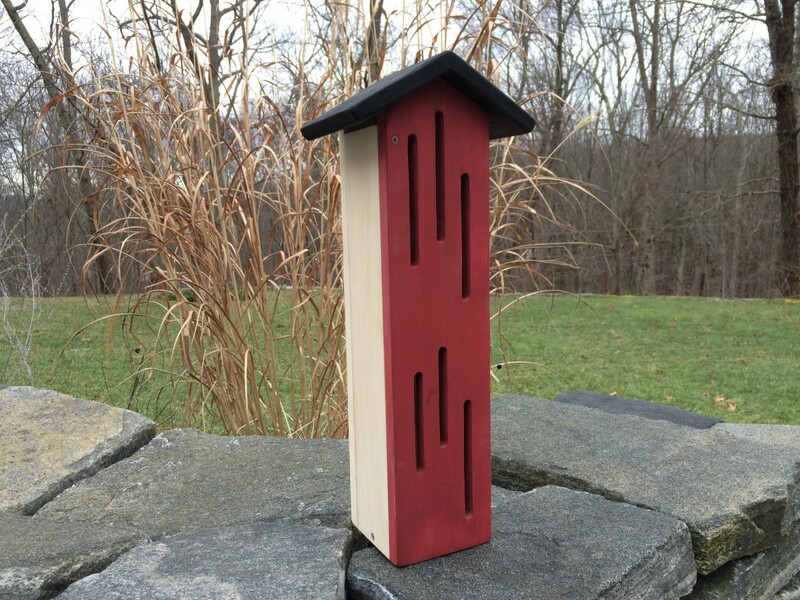 Mounting Block: 6" x 3" x 1-½"
The butterfly house is a basic box with a peaked roof. One side opens on a simple hinge, allowing access to the inside for cleaning or for mounting it to a post. 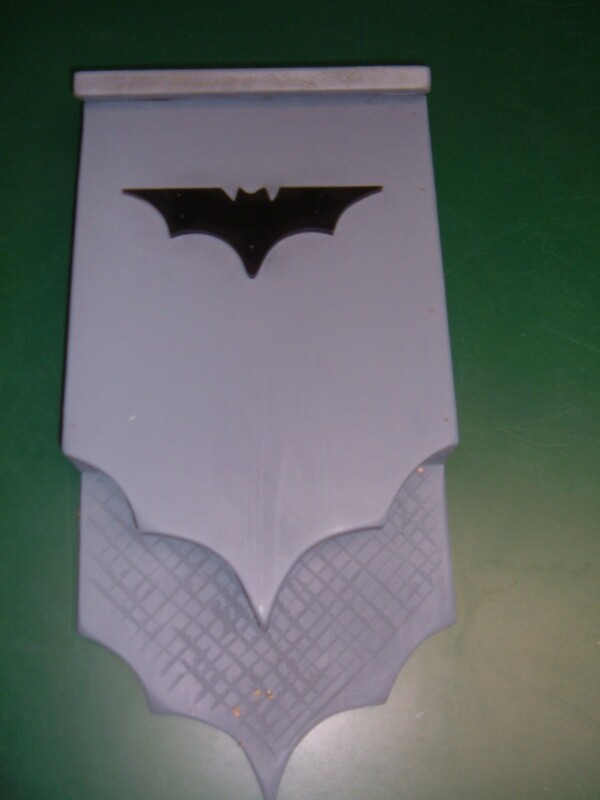 To cut the peaks for the roofline, mark the center of the front and back pieces. Lay out the 30 degree angles long one end of each piece. Cut along the marks to form the peaked ends. Next, lay out the entrance slots on the front section. 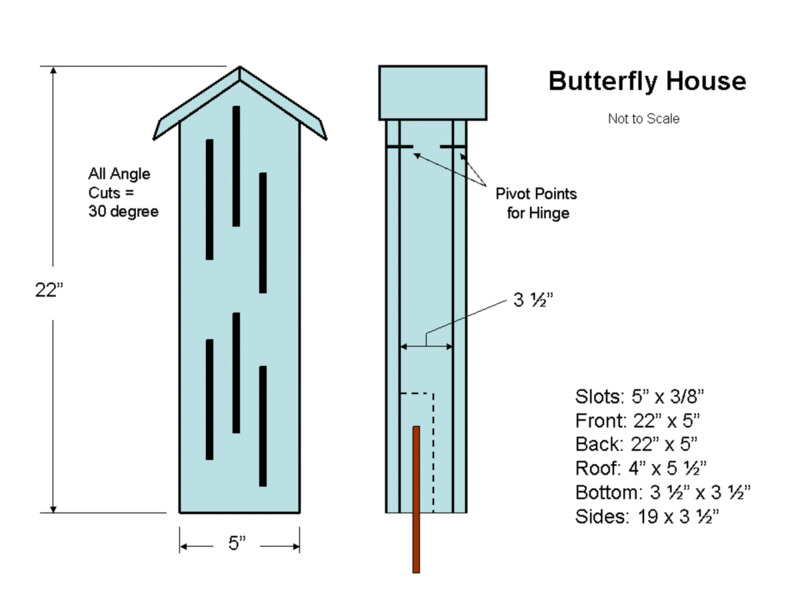 The butterfly box in the diagram (below) has six slots that are 5" long by 3/8" wide. The exact locations are not critical. 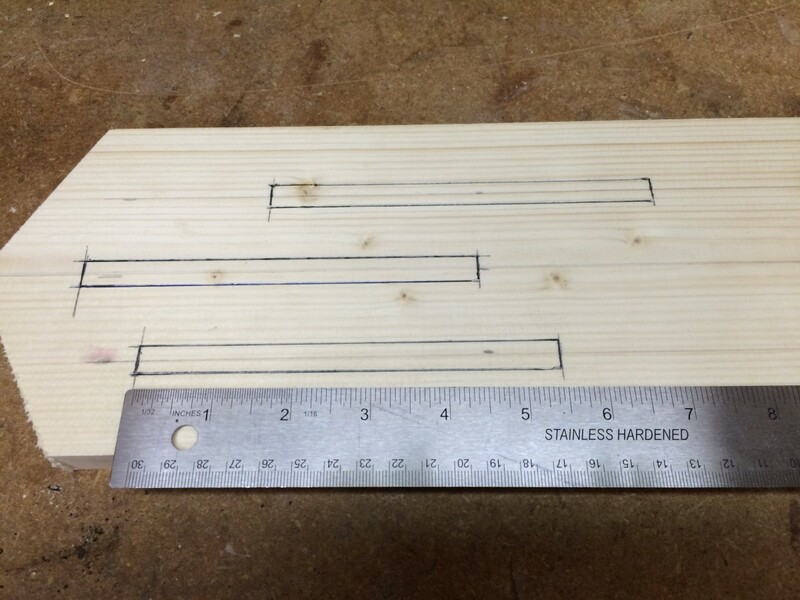 I centered the middle slots, then laid out the locations for other slots in a pleasing pattern. 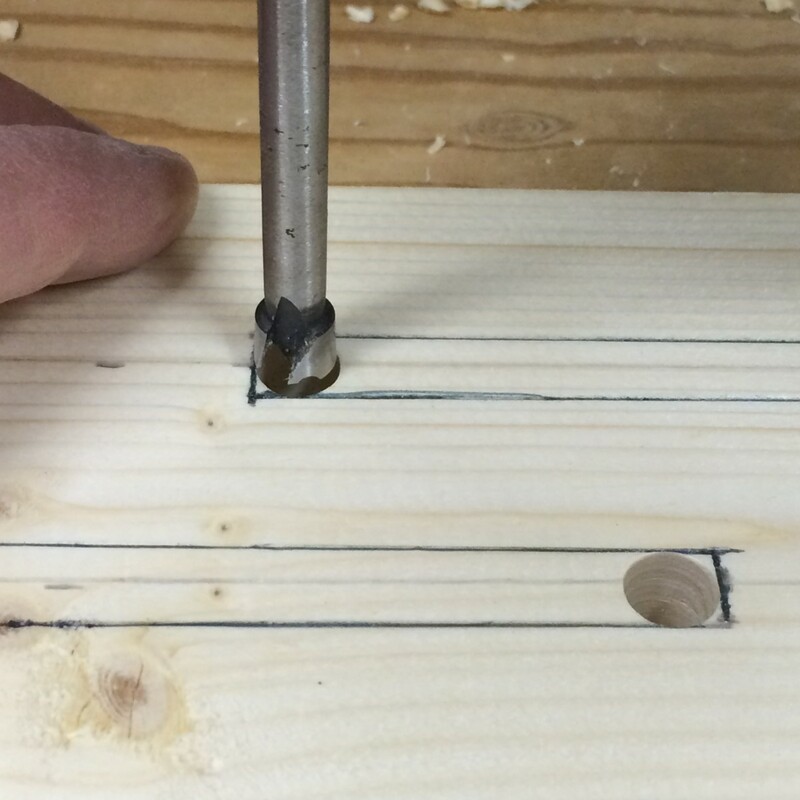 Using a 3/8" drill bit, drill a hole at each end of the slot. Then use a jig saw to cut out the rest of the slot. Smooth out any rough spots with a file. Cut one edge of the roof sections at a 30 degree angle to match the peaks on the front and back pieces. Fitted together, the 30 degree cuts on the roof sections form the peaked roof. I stained and painted the pieces before beginning the final assembly. 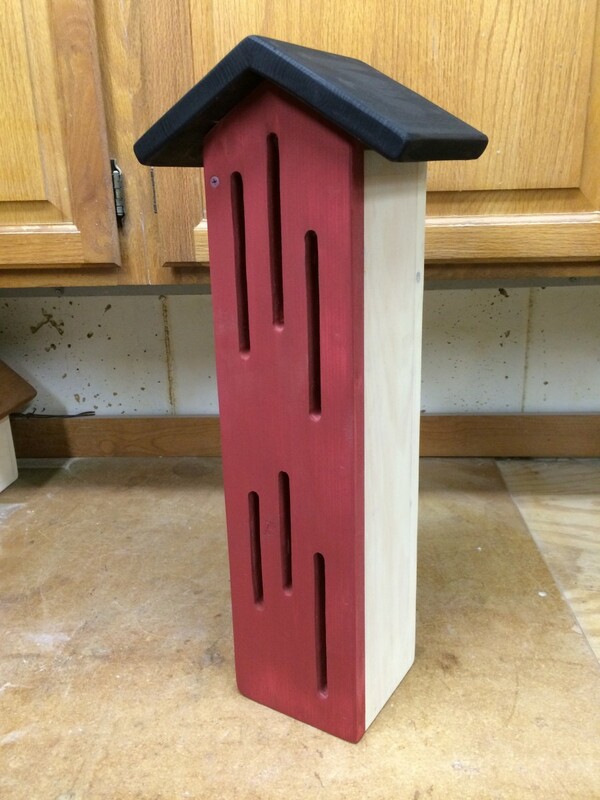 The front piece is painted red, and the roof sections are stained ebony black. The rest of the pieces were stained white. Only the exterior was painted or stained. Begin the assembly by attaching the front to one of the side pieces with exterior screws or nails. Align the bottom edges of both pieces before securing them together. Attach the bottom to the front and side assembly, and then attach the back section. Line up the remaining side with the bottom of the front and back pieces. To create a hinged door, secure the side section to the front assembly with one nail or screw driven into edge approximately 1" down from the top. Then, finish the hinged side by driving one nail or screw one through the back to form a pivot point. Position the hinge nails or screws in the front and back sections directly across from each other, enabling the door to open easily (refer to the side view drawing). Drill and countersink a screw hole along the center of the bottom edge of the hinged door. 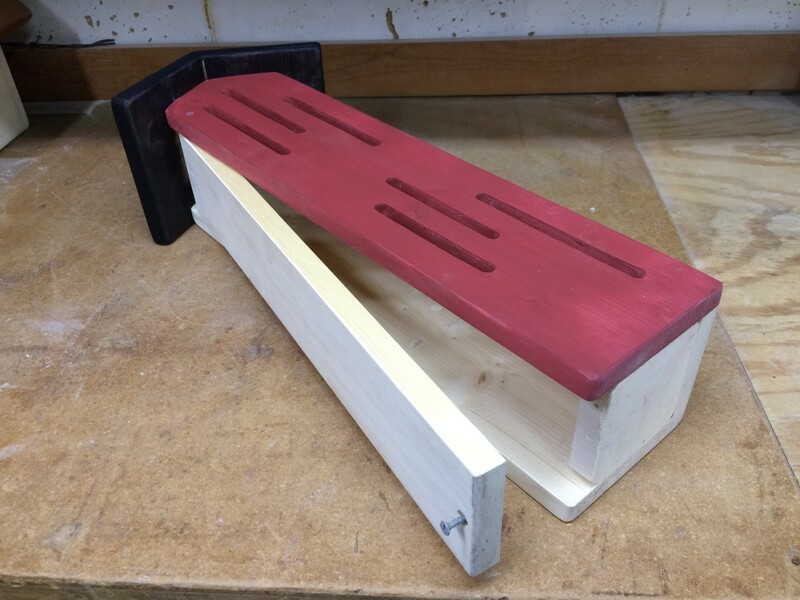 A single short screw will secure the door, yet allow easy access to the butterfly boxes for cleaning. Position the roof sections by attaching the pieces to the front and back sections. Do not nail the roof pieces to the side section which forms the hinged door. 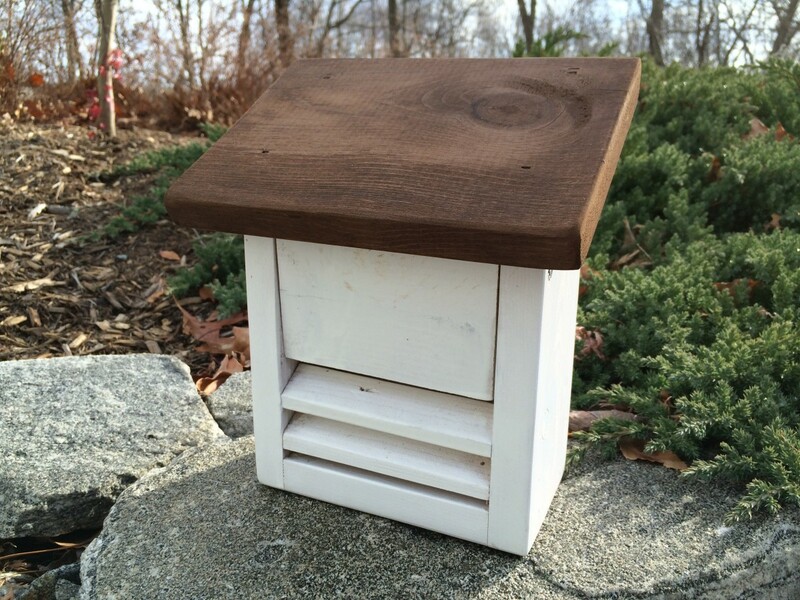 The butterfly box is ready for the garden, or for some brightly colored paint. 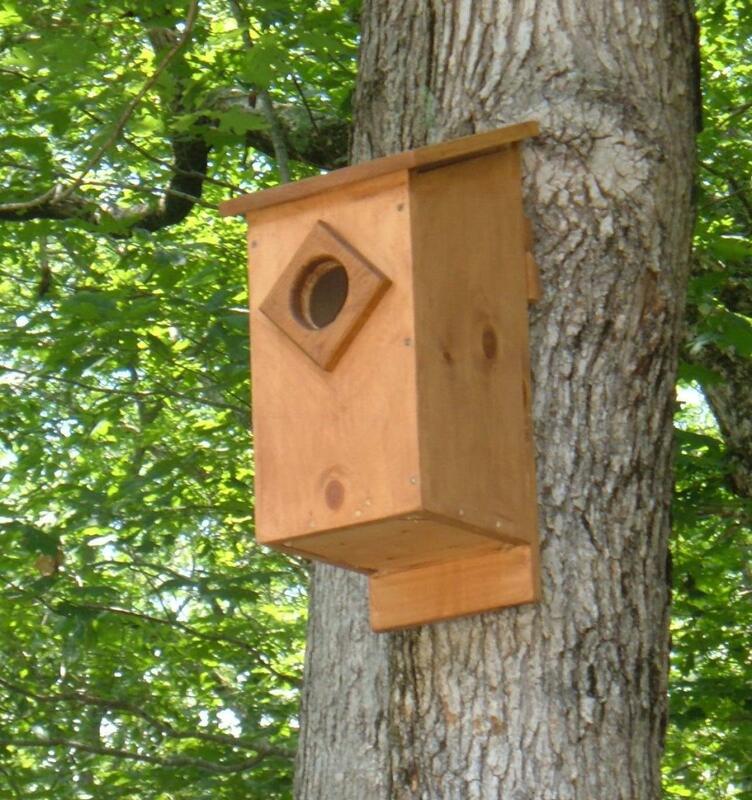 Mount the finished garden butterfly box to a post in the garden. 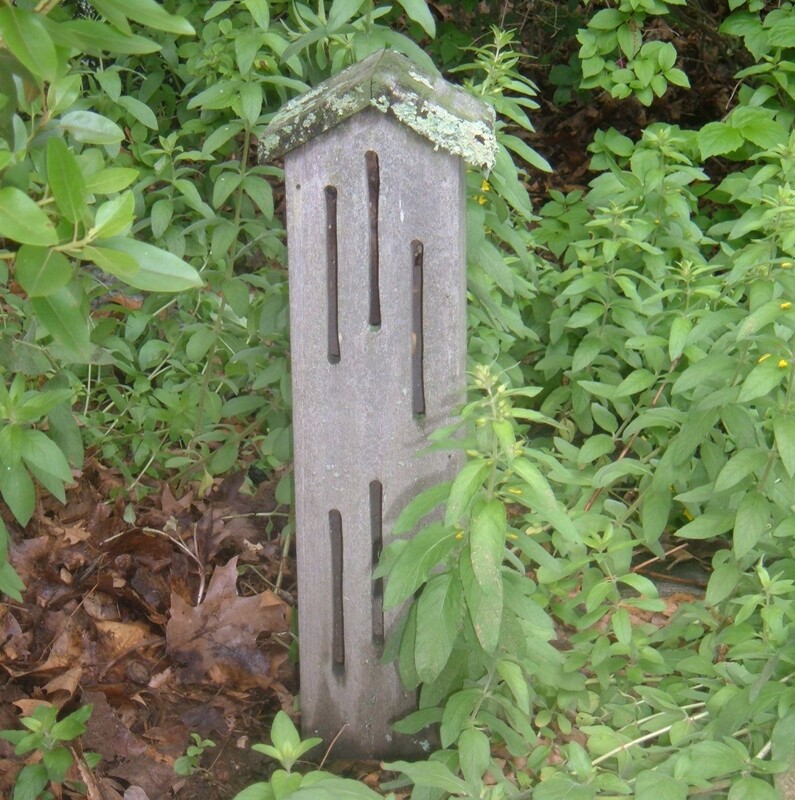 To use a section of ¾" copper pipe as a post, attach a small piece wood (approximately 6" long x 3" wide x 1-½" thick) to the inside of the butterfly house, securing it from the back with a couple of nails or screws. Drill a ¾" hole though the bottom and into the block, and then mount the butterfly box on to a section of copper pipe. Butterflies are beautiful creatures and every gardener enjoys seeing these delightful insects floating and fluttering amidst the blooms in their gardens. Inviting the many different types types of butterflies such as Monarchs, swallowtails, painted ladies and red admirals is as easy as planting the types of plants and flowers that they like to eat, both as caterpillars and then later on as adults. Attracting butterflies to the garden does not require a lot of space, and many nectar providing annuals and perennials can be grown successfully in containers. By planting the types of plants that butterflies need for each phase of their lifecycle from laying eggs and feeding hungry caterpillars to the providing nectar for adults ensures that these wonderful visitors to your gardens year after year. Butterflies are attracted to flowers with bright colors and a strong fragrance. Plant your butterfly garden in full sun, and include the blooms of purple coneflowers, coreopsis and tickseeds, bee balm, and the popular buddleia butterfly bushes. 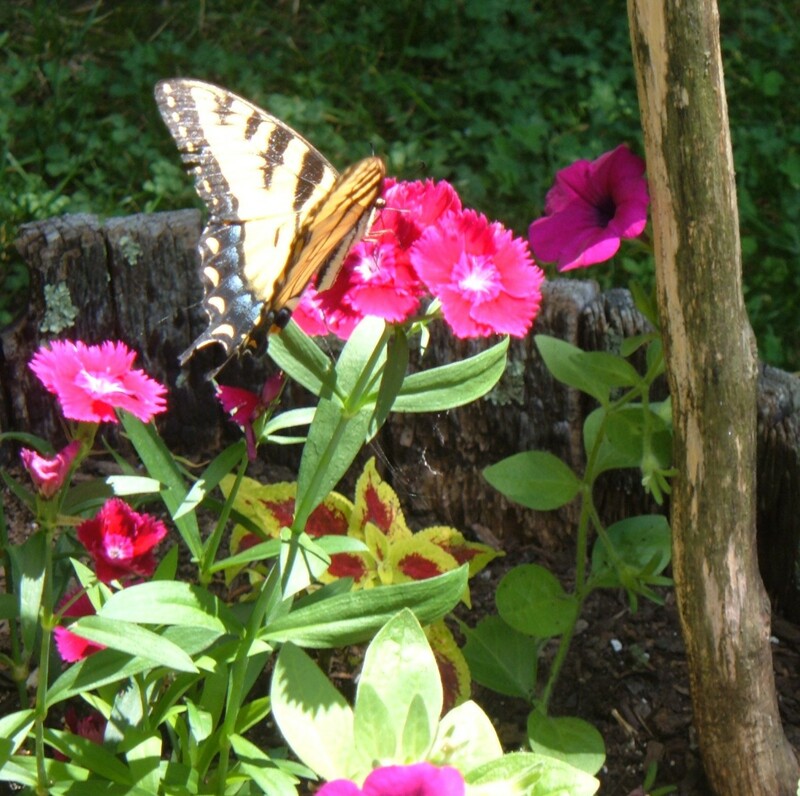 Many annuals offer nectar filled blooms, including cosmos, marigolds and geraniums. 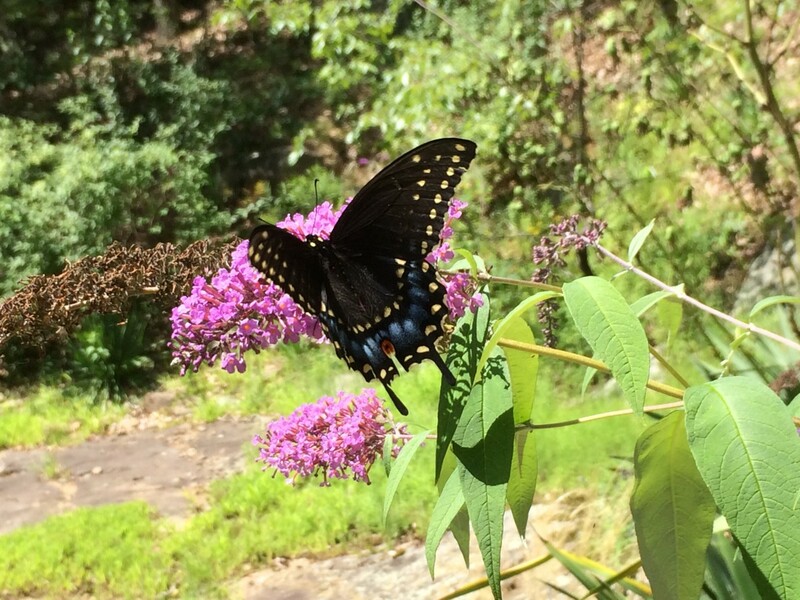 Adding native plants such as goldenrod, thistle and Joe Pye weed increases the diversity in the garden and provides natural food sources for butterflies, and may encourage butterflies to stay in the garden longer and perhaps, to lay their eggs and begin the cycle for the next generation. Add a water source such as a birdbath. Change the water often to keep it fresh, and place a few small stones on the bottom of the birdbath to provide landing areas for the butterflies. To keep the butterflies and their caterpillars healthy avoid using broad-spectrum pesticides that kill the beneficial insects along with all of the bad bugs. And don't forget to add a butterfly house! There are over 17,000 species of butterflies worldwide. More than 750 species of butterflies live in North America. The smallest butterfly, the blue pigmy found in California, is less than Â½ inch in size. The largest butterfly is the Queen Alexandra of New Guinea, and can measure 12 inches from wingtip to wingtip. Butterflies cannot eat, and can only drink. Used to sip nectar from flowers, the butterfly's long flexible tongue is called the proboscis. Butterflies can see ultraviolet light, which aids them in their search for nectar-filled flowers. They are only active during the day, and rest at night in sheltered areas. Butterflies cannot hear. They taste through their feet, and smell through their antenna. Many types of butterflies have toxic chemicals in their bodies. Their brightly colored wings warn birds and other potential predators of their foul-tasting chemical defense. Most adult butterflies live only 20 to 40 days. Some can live up to six months, though some live for only a few days. This short video shows you how to attract butterflies to your backyard, how to keep them coming back, and to create a natural and butterfly safe environment. Do You Encourage Butterflies to Visit Your Garden? I don't have a garden, but I really like butterflies! Does the butterfly house have to be narrow? Does a butterfly house really work? While gardeners may question whether or not butterflies will actually use a butterfly house, most will agree that a butterfly box looks great in the garden. You don't mention what length and width of boards are needed to accomplish the task described in this article? Found our dill plants covered with swallowtail eggs. We protected them and fed them 20 pots of dill. After that was gone, We fed them five pots of parsley which was eaten down to the nubs of stems. We now have over fifty cocoons which should start hatching in one week. Looking fwd to the occasion and we plan a "release party". Excited for such "nature" occurrences. I don't have a garden, but I love to watch butterflies when visiting my parents. They love lavender the most, and they adore to rest on roses when they are in bloom. I am interested in breeding a butterfly looking moth, building a butterfly house is probably needed in my plan. I never knew it existed. I love butterflies. Those butterfly houses are really neat. If I had a garden, I'd want to have one. Thanks for a great lens. I never knew butterfly houses existed, thanks for sharing this information. I do not have a garden, but I really like the explanation of the butterfly in this lens. The butterfly house is so nice, i have not see it before, it is look so funny, and it is a good idea for leaving the butterfly if they would like to stay in it. Lots of great ideas. I love watching butterflies in my garden. We always plant lots of flowers, so we get the benefit of lots of butterflies! Never heard of homes for butterflies. Nice concept! I love seeing the butterflies flutter around our back yard. I always envision them as small fairy creatures. Dragonflies are another of my favorite summertime visitors. How can you not like an insect that eats mosquitoes? I love butterflies but I don't have my own garden due to limited space here in the city... I love visiting butterfly gardens though! 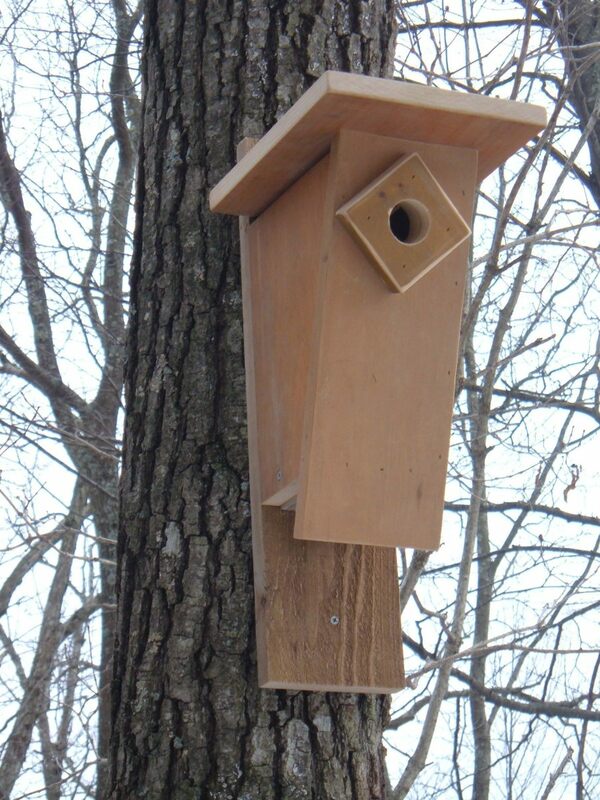 I love the wood theme you are now using to encourage us to make those butterfly houses....every home should have one! Another great DIY project. We have Lantana in our yard, and the butterflies really like it. The butterfly houses are charming! The butterflies really enjoy our Mimosa Tree. I loved visiting this page and all the great instructions on building a butterfly house and all the other wonderful information and pictures. Ooooh, I don't have a butterfly house and I need one! Great instructions! I'm actually surprised by how early the butterflies arrived here at high altitude. Now that the cacti and other wildflowers are starting to bloom, I expect I'll be seeing even more of these beautiful winged creatures. Having a butterfly box intrigues me. Thanks for the tips, ideas, and plans. Appreciated! I like most butterflies, but I'm not that fond of the white cabbage butterfly! In New Zealand loads of people cultivate the swan plant to attract the Monarch butterfly but I've never seen a butterfly box before. Thanks for the information! Yes. very useful article, thanks for sharing, and I love butterflies, and I may decide to make a butterfly house one day! Now I want a Butterfly House in my garden! I have a butterfly garden and we get lot's of monarchs. I am sure they would love a house. Another awesome lens Anthony, always a pleasure. I had no idea that there was such a thing as a butterfly house. How very novel and magical a gardening idea it is. Very charming. 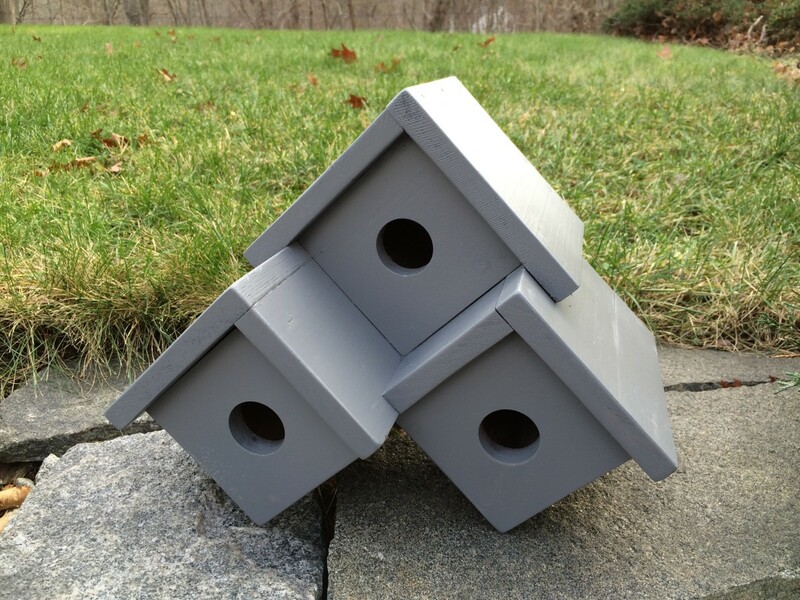 Spring is just around the corner and this is a good time to get started building those butterfly houses to get them in place in your yard. My sister grows milkweed so that its ready for when the Monarchs come to her yard, I would guess she has it started already. Another of your great lens. The butterfly box is on my list of to do asap. Love these ideas. How wonderful to provide shelter for the delicate butterflies. I had never heard of a butterfly house but love the idea and it does look very cool.